How the medical abortion is carried out? Taking Mifepristone and a prostaglandin is a very safe and effective method which leads to a successful abortion in 98% of cases. An early medical abortion involves taking two different medicines 48 hours apart. The effect of the medication will be similar to an early natural miscarriage. After your initial visit to see the doctor, you will have two more appointments on different days. 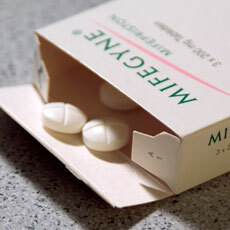 On your first visit you will be given an abortion pill called mifepristone, which blocks the hormone that makes the lining of the womb suitable for the fertilised egg. After taking the first pill, you will be able to go home and continue your normal everyday activities. Very little will happen while you are waiting for the second part of the treatment. A few women will have mild cramps and a little bleeding, but most will not. Two days later, on your second visit to the hospital or clinic, you will be given the second medicine, prostaglandin. This part of the process can be sligthly painful (like during the period), but you can take a painkiller.